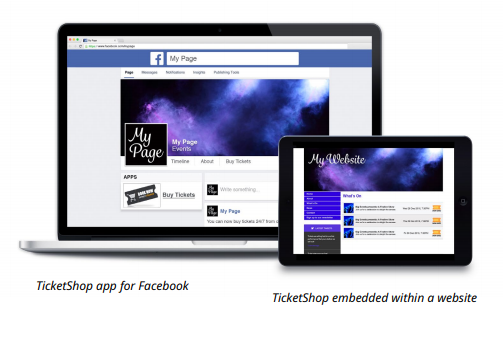 With our TicketShop app, you can integrate your TicketSource sales page into your Facebook Page or website to offer customers a seamless ticket buying journey. The TicketSource Shop App can be added to Facebook so your customers can book directly from your company/venue Facebook page*. Note. Due to Facebook's new guidelines, the Page Tabs feature (which includes the TicketSource Shop App) is only available to Pages with 2,000 or more fans. Event Organisers who have already integrated the TicketSource Shop App will not be affected by these changes. Firstly you will need to make sure you have administrator access to your 'Page' (the app can't be added to a 'Group' or 'Event' page). Go to "Events" | "Publicise Events"
You will be prompted to log into Facebook and then select the Page you would like App to be added to. Finally select 'Add Page Tab' at the bottom of the screen. A 'Buy Tickets' tab should appear on the left-hand side. Click on the tab and the first option will ask to finish your public sales URL. you would just need to enter'test' in the box and click save. Your events should appear below and customers will now be able to book from your Facebook Page! The TicketShop App will also appear in the right hand column in the 'Apps' section as a 'Buy Tickets' button with a black ticket icon. If you click on Manage Tabs you can change order that the tabs appear on the left hand side and similarly you can edit the order of the apps on the right. If you have a website, you can integrate your TicketSource listings page into it to allow visitors to buy tickets via your own website. All you need to do is add a short piece of HTML code into your website. The TicketShop app will always be up to date, displaying your current event listings with buttons to buy tickets. No further maintenance is needed. You will then be provided with a short piece of code to insert into your website. I don't have a website or Facebook Page? If you don’t have a website or a Facebook Page to add the TicketShop app to, you can add your unique TicketSource URL to your posts to automatically generate a ‘BOOK NOW’ button. You can download a step-by-step guide to setting up TicketShop below. If you need assistance with adding the TicketShop to your Facebook page, please get in touch via email or call our Support Team on 0333 666 4466. *Please be aware that due to limitations with Facebook's mobile App, the Buy Tickets tab and app will not appear when viewing the page on a mobile device.